I had left it in an outside room for about a year and ants had got into it and layed eggs etc. So I unpacked it and opened it up and cleaned it out as best I could. I then saw that it was not printing black, so I bought a new cartridge. After putting it in and printing it still was not printing black. I did a test print and all other colours worked except black. It is always a good idea to at least try the manufacturers website and see what they suggest to fix black on a Brother DCP-J105. The solutions didn’t work for me. So I tried a youtube video that showed a cleaning kit and using a syringe to push cleaning fluid into the palce the ink usually goes. I did that with my home made cleaning fluid (alcohol) and a syringe and it didn’t really work. Still no black. In that video the british bellend said that if it does not push black ink out the print head your printer is most likely dead. Well joke is on him, all is not lost, it still may be alive. It was to blow compressed air into the same place where ink goes and that would unblock it. I did this with a straw and my own breath (pauper lifestyle) and miraculously a few lines of black now print. After doing a print test page a few dots of black now print. I cleaned it and printed a few black ink test pages and it is gradually getting more black spots. The goal is to have that entire block coloured black. So I cleaned it 2 times in a row now and a few more dots/lines appeared. Note: Cleaning the Brother DCP-J105 does waste ink. I’m now going to clean it 5 times. Dammit, now it is worse. Went from 70% full to 5 dots. I printed a few pages and now I’m back to square one. Not a single black spot. So I blew smoke up the ink shoot again and nothing. I cleaned it 2 times in a row manually and it now was 95% filled. I printed pages and in 5 pages ink decreased to nothing. Basically Brother tells you it no longer wants you half filled ink cartirdges. To them, half full is empty. Yet more evidence on how printers companies are legally scamming of regular people. The error will say Printer Ink Not Detected for a specific colour when it is low (but not empty). Now you can’t print anything. So all you need to do is black out the ink level window to trick the printer into thinking the cartridge is full. This will make your printer work. 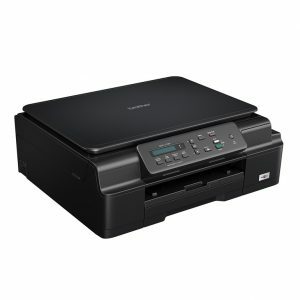 This also has an added benfit in making your Brother DCP-J105 printer not show annoying out of ink or low level popups as they will always be full. You will of course need to refill or replace the cartridges when ink is not showing up on printed documents. That said, the saving on printer cartidges and ink will more than pay for that inconvenience.